Interests - Likes Minecraft, football, Lego, DVDs, Xbox computer games, arts and crafts, drawing and colouring. Suffers from any developmental delay? - Yes - delayed in language and communication. Harrison is known as Harry. Harry was born 5 weeks prematurely and spent three days in special care. He was then in and out of hospital with feeding problems, reflux and infections. At 18 months old he saw an immunologist and was diagnosed with an immune deficiency. He then started 3 weekly hospital visits for immunoglobulin therapy but was still in and out of hospital with infections. Harry was in hospital aged 3 with ecoli septicaemia and was very sick for 10 days. It was also discovered he had Epstein Barr virus and had a months treatment with a chemo drug called Rituximab which wasn’t very nice at all. Harry also has behavioural problems and was diagnosed with ADHD and then when he started school it was picked up that he had developmental problems and was diagnosed with autism. Harry started having subcut immunoglobin therapy and I was trained to do this even though I hate sticking needles into my child. 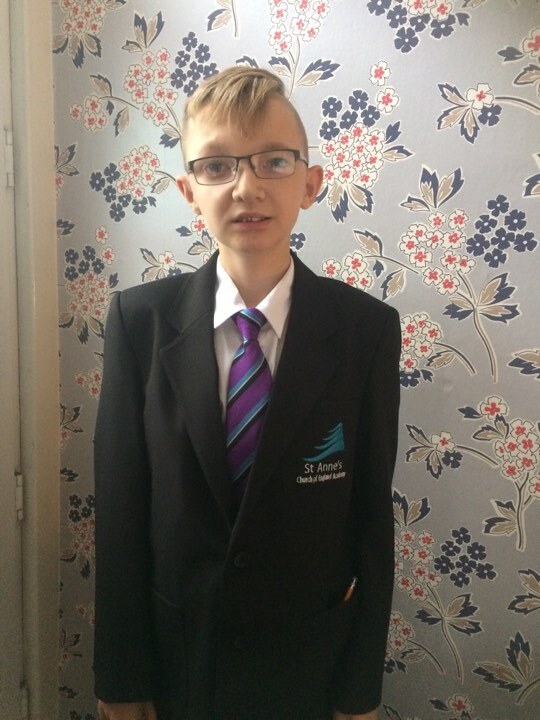 Harry was referred to the geneticists because of his range of problems and they have found that there is a problem on his x chromosome so are doing more tests. The genetic testing has been very stressful for the whole family as I may carry the same gene and may have passed the abnormality onto him so feel so guilty. Ellie, his 15 year old sister, will also need testing as this could impact on her future plans to have children. Harry is very small for his age and has now been referred to the endocrine clinic as he may need growth hormone so the daily battles still go on. Harry is still having weekly immunoglobulin therapy infusions and is so fed up with it at the moment. He has nightly injections to make him grow. His weight is slow, so he has a feeding tube and is fed overnight with this. He has recently had a bad tummy and has been off school over a week, he’s fed up with feeling rotten. He loves receiving post and smiles, as life is horrible in the winter as he picks up more bugs and infections due to his Immunodeficiency. Thank you to everyone that writes to Harry and sends presents to cheer him up. Thank you everyone who has sent Harry post and gifts over Christmas, he has had a wonderful time. Harry has still been having infections, weekly immunoglobulin infusions, daily growth hormone injection and overnight peg feeds. He has put on a massive 6kg since March which is wonderful. We had a phone call from a Genetic doctor and Harry has been on the DDD study for six years. They have discovered a new Gene mutation called TLK2 and this is why Harry has all his medical conditions. So we have a reason for his difficulties, it’s hard to take in but there are only 5 worldwide so not much is known about it . Thank you for your continuous support, happy smiles and gifts. Fingers crossed Harry might get out of hospital, he went back to theatre and had his peg changed to a button, as the pressure was too high.This was causing it to be too tight and it kept getting infected. Harry has had a really bad month, he has been admitted to hospital 3 times with viruses and he is really struggling with everything. We have just received a letter from the hospital and they are listing Harry for a gastrostomy, so we just have to wait for the appointment now. Harry has been in hospital for a UTI. Just two days after he got home though, he ended up back there with shingles. He’s had a rough month, but luckily, we got him well enough in time to start High School. Harry is still on daily injections of growth hormone and continues to have his weekly immunoglobulin therapy, however the consultant has tripled his dose due to having loose bowels. He is coping well but not gaining as much weight as expected, so they have been talking about a gastrostomy. Harry is starting High School in September which is going to be stressful. Thank you for all his post and smiles. Harry has been very unwell and lost lots of weight which is a concern. The doctors are thinking of giving him a gastrostomy if he doesn’t gain weight. The immunology doctor wants to tripple his infusion dose to 30mg of Hizentra a week instead of 20mg a fortnight. He is going into hospital to have his infusion where he will have three needles giving him his treatment. He’s such a good boy. Thank you for all his post. He’s really into Minecraft, football and still loves his Lego. Many thanks for everything. Harry has not been well and is going in to hospital on Wednesday this week. He will be having colonoscopy, endoscopy and biopsies on his bowel to see if Epstein Barr Virus is back. I think he will be needing smiles. Thank you for the post that has been sent to him. Harry has not been well recently and I went to Birmingham to see another immunologist as I thought our usual immunologist was rather too familiar with Harry and I’m so glad I did. In 2008 Harry was unwell with Epstein Barr Virus in his bowel and was treated with Rituximab (a Chemo drug). Harry then stopped having bowel problems. This past 12 months his problems have come back and I told doctor about this. He then voiced his concerns to Manchester Immunologist who had obviously forgotten about it, as he said something had come to light and so Harry needs urgent scopes and endoscopies as soon as possible. So we’re now praying it’s nothing sinister and are glad I sought a second opinion. Mummy’s instinct. Sister Ellie broke her leg and has had to take a year out of uni, and I’ve been suffering with my depression and have also been diagnosed with an immune deficiency, like Harry. Harry has had a bad month. He’s been unwell and having some jerking movement and falling a lot of late. Last week he had four falls, one that resulted in a broken front tooth and injured face and leg so he ended up in hospital. He had to go down to theatre to sort out his mouth and teeth and had a brain scan. Luckily no tumours were seen but he’s having further tests for epilepsy. He’s very sleepy and clumsy at the moment so more hospital appointments and now the dental hospital to add to the list. I have also been on crutches with a bad leg and not been coping well with my depression. I’m feeling very alone and fed up, but thanks for cheering Harry up as he’s not been as happy as he usually is. Many thanks to all. Harry is currently in hospital with shingles. Harry has been off immunoglobulin for eight months as a trial, but he continued to get sick and his antibody levels came back low, so in December he started back on treatment. At the end of December he was poorly and was in hospital for 8 days with Acute Gastroenteritis and lost more weight. Chicken pox was going round at school and because of his non existent Antibody Levels and being prone to shingles and the chicken pox virus, he couldn’t go to school. From 2nd December until 3rd March he remained at home with his Mum. This was particularly hard for him because he didn’t see his pals at school and was bored and fed up. 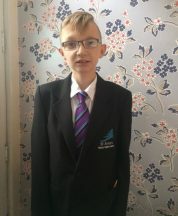 He returned to school two weeks ago and has enjoyed his time back. Thank you for all the smiley post and gifts from everyone, he loves them. They mean so much to him. Keep well everyone. Harry has not been well and has had a couple of bad months. His hypo mobility has been bad so he’s been using his wheelchair more. He was in hospital due to his leg pain and put on stronger meds. After he was discharged he then had nose bleeds and high temperatures so we had to stay. Then he developed a non blanching blood rash and had sepsis so he was put on IV antibiotic for five days and when we came home he still wasn’t a hundred percent and started with tummy pain. We went back to the GP who said he showed infection on his urine. I contacted his Immunologist at Manchester Children’s Hospital who we are seeing next week. Harry has been off his treatment for Immunoglobuling but with recent bacterial infection I’m hoping he will be put back on his two weekly infusions to try and keep him well. Harry is poorly with a tummy bug and his asthma today as well now. He loves his post and gifts, it cheers him up when he’s having a rough time, thank you all so much. Yesterday I received a gift from Post Pals, what a surprise, some yummy chocolates and a scarf which I’m going to enjoy tonight after a bath when Harry is in bed. Thank you all. Harry continues to be troubled with infections and viruses but is having a break from Immunoglobulins. He has daily injections of Growth Hormone treatment and has lots of daily medicines but still continues to smile. We have seen genetics and he has recently been diagnosed with Uniparental Disomy on Chromosome 1. This is very rare and not much is known about it but genetics say this is why Harry is troubled with his immune deficiency ADGH ASD and Growth Hormone deficiency and also hyper mobility. Due to his hyper mobility he has been in a lot of pain and has now got to use a wheelchair for pain management. Harry continues to solider on though and is a happy boy and copes so well with everything. His hobbies are football, he loves Man United, and he also loves outdoor activities. We have recently bought a tent and have had a few camping trips which was great fun. Thank you for all your post as it makes him happy. I’m sorry Harry’s story has not been updated but we have had a rough time as a family over the last nine months. I would like to thank everyone who has written and sent gifts to Harry as they really do cheer him up. He loves his Dottie teddy and he takes it to bed with him every night. Whenever I am giving Harry his treatment or if he is in hospital, Dottie teddy always has to be by his side for a cuddle! Usually summer time is better for Harry as there are fewer bugs for him to catch but last summer Harry was ill with shingles, having it three times by November. This meant quite a few stays in hospital. Due to the gene defect Harry has, he has failed to gain weight and grow, so we started daily growth hormone injections at the end of last year. It was really hard for Harry having to have yet another daily treatment but they did help. In February, Harry’s consultant asked us to meet with another consultant specialising in genetic disorders. The outcome of the meeting was that they think Harry could have a rare genetic disorder called Cartilage-hair Hypoplasia and we are now waiting for the results of the testing. In the meantime, the growth hormone injections have been stopped because they can cause tumours in children with Cartilage-hair Hypoplasia. Harry continues to have immunoglobulin therapy in hospital every three weeks and he has just been discharged following his 4th stay in hospital in the last four weeks due to a strep throat infection. We are hoping to stay at home for a bit now. Harry is unwell and in hospital now with a non-blanching rash. He’s so fed up.